Architects are known for their ability to see the entire problem and then to systematically go about solving that problem; it’s one of the traits that I find most admirable in the profession. The Life of an Architect Playhouse Design Competition is an event that brings out this trait during the process of designing what one the surface seems like a fairly straightforward problem – design a playhouse. With all the requirements, restraints, and aesthetic challenges that exist, designing and documenting a winning playhouse is no small feat. This week we will take an up close and personal look at each of the three winning playhouse entries and the designer behind them. First up is “Ellie the Elephant” Playhouse Designer Andres Moreno, who currently lives in Alexandria, Virginia, USA, but is originally from Costa Rica. Bio: I’m Andres Moreno, and I am originally from Costa Rica. I have been living here in this country for two and half years. I used to be architect in my country but I still working in design on the side. And now I’m seeking an entry-level position or internship that will allow me to apply my considerable professional skills from Costa Rica while also becoming better acquainted with the architecture field in the United States. I have a degree in architecture from the University of Costa Rica, San Jose, Costa Rica. Before I came to the US, I was an independent architect in Costa Rica, focusing mostly on housing. I’m currently looking for positions in the Washington, D.C. area and would like to focus on urbanism. I still do design work on the side. A friend from Costa Rica sent me the link for Life of Architect last year. I participated in the 2014 competition, but my design wasn’t chosen. I thought about it and decided my design was more directed to adults than children, so this year I approached the design from the point of view of what appeals to children. It took one week to come up with different ideas and sketches. Once I decided on a theme, I did an initial sketch and then it took three days to make changes and finalize everything. I used AutoCAD to draw the elephant, then SketchUp for the modeling and Lumion to render the model. I used Adobe Photoshop for perspective and Illustrator to make the presentation. Making the construction drawings was a little challenging because I have always worked in metric units and had to convert to imperial units, but it all was fine in the end. No, I haven’t. This is my first playhouse, but hopefully not the last. While I was in university I organized and participated in different projects with kids, creating urban spaces and painting murals. Fantastic! CASA is a great organization and I feel honored to be a finalist and have my design be built and donated for such an important cause. When the competition started, I had a lot of ideas and sketches, but my nephew inspired the elephant idea (he has a stuffed elephant named Ellie). My initial drawing was a very abstract elephant, but I was critical of myself and changed the aesthetics to find a way to get the attention of children. I hope so. It would be very exciting to see the playhouse in-person. I have participated in various competitions in the past and try to do 1 or 2 a year. This is the original design submission that was evaluated during the judging rounds. The judges were drawn to the simplicity of the concept and the uniqueness of the playhouses shape. While considering all requirements for evaluation (creativity, appeal, originality, buildability, and construction costs) the judges felt that this design really addressed all 5 main considerations in a creative manner. I typically try to be present when the playhouses are being delivered – it always an exciting moment. Normally there are about a dozen or so people, all nervously standing around as the playhouse they just completed building is hoisted up and carted off on a forklift. It seems as though there is always some concern that something could go horribly wrong (to my knowledge, nothing ever has). So this is the completed entry for ‘Ellie the Elephant’ and I think it turned out wonderfully. The rounded plexiglas you see in the picture above is only there while the playhouse is on display and is not a part of the original design. 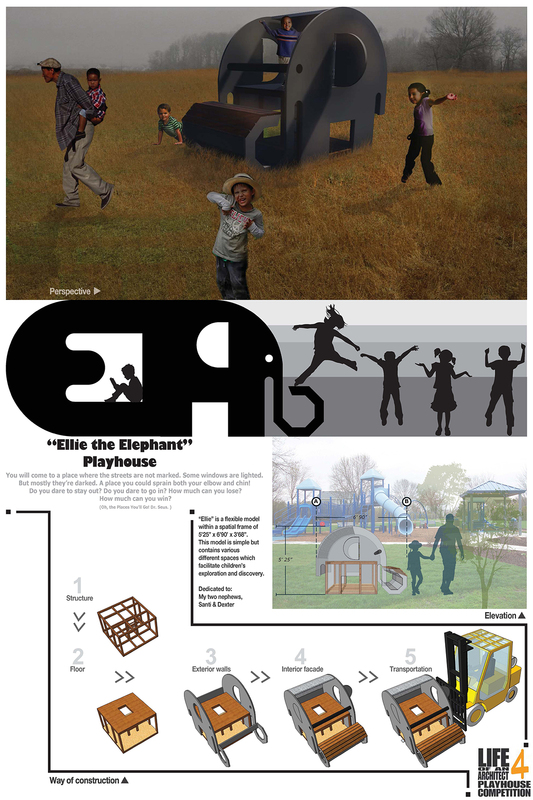 I would like to sincerely thank the ‘Ellie the Elephant’ designer Andres Moreno for bringing his considerable talents to the 2015 Life of an Architect Playhouse Design Competition, and for giving us a design that is truly unique in this event. I would also like to thank Perk Homes for tackling the challenge of building a playhouse that didn’t just start off as a storage shed from the local big box construction warehouse. There were three playhouse winners in this years design competition and tomorrow we will feature another playhouse and feature that designer.